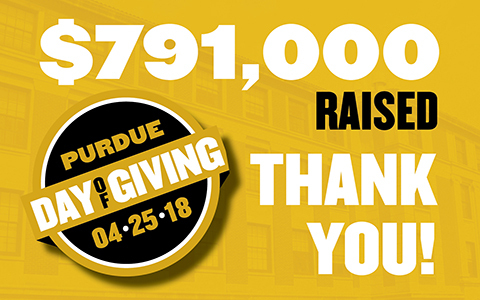 From midnight to midnight on April 25, 2018, Purdue University College of Science supporters donated a record 450 gifts for a total of $791,000 raised for the 2018 Purdue Day of Giving. The College of Science is ever grateful for a very strong showing from alumni and friends, whose generous gifts will mostly be dedicated to student scholarships. The total number of gifts was the 10th highest among all participating Purdue units. Donors also shared thoughts, pictures, and videos on College of Science social media channels. 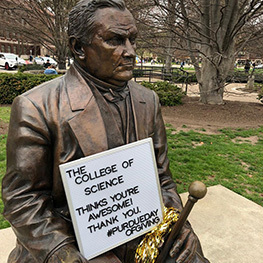 To show gratitude for those who "made their mark" and provided access and opportunities for College of Science students, students wrote thank-you notes to donors during the day. The Department of Earth, Atmospheric, and Planetary Sciences is excited and grateful to announce that a new award has been established in honor of EAPS faculty member Jay Melosh. Lee Harwell Jr., Elise Klein, and their daughter, Megan Harwell, a 2018 Physics and Planetary Sciences graduate, have established The H. Jay Melosh Planetary Science Engagement Fund, which will aid both undergraduate and graduate students with their expenses in attending academic conferences. The Department of Biological Sciences is sincerely thankful to the Purdue biological sciences alumnus who established an endowment in honor of Professor Emeritus Joseph W. Vanable. Through a $400,000 bequest, the donor has established the Ultimate Achievement in Life Sciences Scholarship Honoring Dr. Joseph W. Vanable, Professor Emeritus. Professor Vanable was a consummate educator who served as mentor for countless students. The scholarship will support eligible undergraduate junior and seniors enrolled in Department of Biological Sciences courses who have recently made significant academic progress.